Kasey Hansen yelled as she pointed her loaded handgun at a target’s chest at a shooting range outside Salt Lake City. Hansen carries her pink handgun, Lucy, with her every day to each of the 14 schools in which she teaches. The 26-year-old teacher works with elementary, middle and high school students with hearing impairments in the Granite School District. She is one of an unknown number of armed teachers across the country. In 28 states, adults who legally own guns will be allowed to carry them in public schools this fall, from kindergarten classrooms to high school hallways. Seven of those states specifically cite teachers and other school staff as being allowed to carry guns in their schools. But a News21 examination of open-records laws in those states found that teachers or staff who choose to carry a firearm into their classrooms are not required to tell principals, other teachers or parents. Only five of those states have completely open access to concealed carry permit information through public records requests. Some state’s laws completely seal off those records and others are silent on the issue. In states where it is legal, parents may have no idea that their child’s teacher carries a gun into the classroom every day. School administrations can decide to gather the information, but they don’t have to disclose to anyone. From the office of the superintendent to a secretary’s desk, there is no file that contains the information. After the December 2012 shooting at Sandy Hook Elementary School in Newtown, Connecticut, the threat of an attack by an armed gunman in elementary and high schools prompted five states to give school administrators the authority to arm their teachers. In 2013, legislation was introduced in at least 33 states related to arming teachers or school staff, but of the more than 80 bills introduced, only Alabama, Kansas, South Dakota, Tennessee and Texas enacted laws related to public schools, according to a report by the Council of State Governments. Connecticut law, which previously let school officials allow people other than police to carry in schools, was revised after Newtown, so that only officers can carry guns on school grounds. Georgia passed a guns-in-schools bill this year. The other 22 of the 28 states allowing guns in schools already had versions of such laws in place. In some cases, school districts and local school boards can designate school faculty to get specific training in order to carry. A few states, including Hawaii and New Hampshire, don’t set policy in state law. In Utah and Rhode Island, anyone with a concealed carry weapons permit can bring a firearm onto public school grounds. In Utah, guns are commonplace in public, with more than a half-million people holding a concealed firearm carry permit. Residents with a permit can legally carry almost anywhere in public, from elementary schools to local restaurants and bars to municipal parks. Families pack rifles alongside sleeping bags in their camping gear, shooting ranges are popular date spots and Duck Hunt is more than just a video game. The Utah law that allows anyone with a concealed carry permit, including teachers, to carry on school property has been in place for more than a decade. A provision that would have restricted possession on school property was taken out of the bill when it passed. Hansen got her concealed carry permit a week or two after Sandy Hook and participated in a free training course offered to teachers. She then bought her pink-plated Cobra 380 handgun, and started carrying it in her classroomsabout seven months ago. Hansen has been a teacher for four years. She found her calling while taking an introduction to special education class at Brigham Young University - Idaho. Hansen grew up in Salt Lake City, in a state with some of the loosest gun laws in the nation, but wasn’t raised in a gun-toting family. Teaching at multiple schools a day, Hansen drives around the school district in her white Mazda personalized with eyelashes on the headlights. She works one-on-one with each of her students on language skills, vocabulary, and reading comprehension among other subjects. All of Hansen’s students have hearing aids or a cochlear implant, which could make an emergency situation particularly chaotic. Handling a gun and having the composure to fire it in the event of a shooter entering a school isn’t part of the curriculum taught to education majors nor are those responsibilities outlined in a teacher’s handbook. “I’m not the best shot, but I can hit a target,” Hansen said. She goes to the shooting range every couple of months to practice. In the 10 years since teachers have been allowed to carry guns in Utah, no fatal K-12 school shootings have occurred. Some argue that schools aren’t falling victim to attacks because of their unique, additional security measures. Others think guns in classrooms present more risk than potential for reward. Gunn, a member of the board of directors of the Gun Violence Prevention Center of Utah, is also a Holladay City Councilman whose office in City Hall used to be in an old school building. Working there and going home every night to a wife who teaches at a local junior high school gives Gunn an authentic sense of angst. Gunn is also concerned with the message it sends. He believes it creates an unnecessary sense of fear for students that they are in danger. 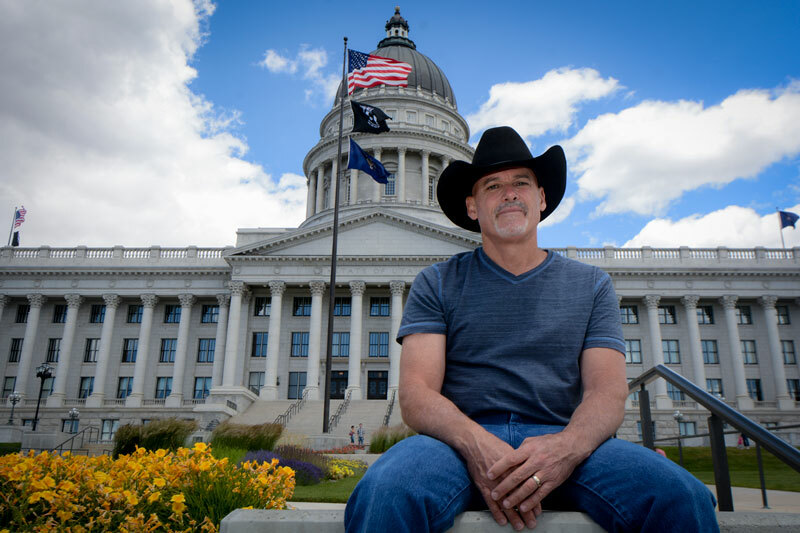 Ten miles north of Holladay, Ted Hallisey stepped out of his forest-green Ford pickup truck at the south end of the Utah State Capitol in Salt Lake City. With a rugged sort of sophistication, the volunteer physical education teacher walked up the stairs, thumbs tucked into the pockets of his blue jeans. A cowboy head-to-toe in black Ariat boots, a black Stetson hat and a gold plated 1999 Days of 47 Rodeo belt-buckle, Hallisey was a stark contrast to the building’s white marble steps and pillars made of locally mined Utah granite. For Hallisey, it was important to address the school gun rights issue at the most official place where rights are supposed to be honored and discussed. As a teacher and kid’s health advocate, Hallisey believes there is too much risk in arming a teacher or staff member. Hallisey was raised in the Western lifestyle in a rural area where guns were part of the family. His cowboy background combined with his educational experience tells him kids are best kept safe by avoiding the people who would do them harm. Just down the street from the Capitol, stay-at-home mom April Jolley reloads Nerf guns for her sons in their eighth-floor apartment overlooking the Mormon temple in the heart of the city. Jolley, whose three young boys will attend Ensign Elementary School in Salt Lake City, said she would feel safe knowing her kid's teacher had a gun. For Jolley, the fear of who could come in and attack outweighs the fear of a teacher using a gun in a situation where it wasn’t necessary. A teacher having a gun in a classroom makes her feel safer as long as that teacher has training and knows how to properly use it, she said. For Jolley, whose oldest son is entering kindergarten in the fall, the fear of a school shooting is just as prevalent as the fear of her kids being kidnapped. Jolley said her kids see guns as more of a novelty, and they know that if you see one you don’t touch it because you never know if it’s loaded. Schools are making efforts to put more stringent security measures in place, including trained law enforcement officers, strict hall access rules with automatic locks on closed doors throughout the school day and additional emergency drills. The National Parent Teacher Association has been active in the conversation about guns in schools and gun violence prevention. Although the PTA supports citizens’ rights to bear arms, the organization believes that certain restrictions should be made to reduce violence and incidents that involve firearms. In its position statement on gun safety and violence prevention, which was adopted in 1999, the National PTA said the most-effective day-to-day school climate is one that is gun-free. In 2013, after the tragedy in Newtown and the introduction of legislation across the country, national education organizations responded. Groups of teachers from around the country have also weighed in. The National Education Association teacher union is composed of 3 million educators and considers itself the voice of professionals across the country. An NEA poll of 800 members in January 2013 found that educators are opposed to arming school employees. Only 22 percent of NEA members polled favor firearms training for teachers and other school employees and letting them carry firearms in schools; 61 percent strongly opposed the proposal. But members of the Association of American Educators, the country's largest national, non-union, professional teacher association expressed mixed feelings on safety and gun issues. The results of a poll conducted in February 2014 found 61 percent of those responding supported a proposed Arkansas policy that would allow educators access to a locked, concealed firearm after a training course. Despite the majority of members supporting firearms in schools under those circumstances, only 26 percent of surveyed teachers would consider bringing a firearm to school if permitted to do so. Laws are passing in an attempt to reduce the recurrence and magnitude of deadly shootings in K-12 schools. Only three-and-a-half years into this decade, more people have already died in K-12 school shootings than the total number in any other decade over the last 50 years. Since 2010, 60 children and faculty members were shot and killed in elementary, middle and high schools. There have already been more school shootings — 24 since 2010 — than there were in the previous decade. Teachers and other faculty aren’t hired based on their reaction to a crisis situation and whether they’ve had adequate training to carry a firearm into their classroom. In most schools teachers aren’t packing a handgun with their lesson plans, and those that do keep it quiet. Concealed carry protocol provides that the gun is completely hidden from view, so technically no one would be able to determine whether a person is carrying. Hansen keeps her handgun concealed at all times while in school whether in the small of her back or in the zippered compartment of the rhinestone-embellished pink purse she bought at a gun show. The purse matches her gun, Lucy. Hansen says she sees herself as Lucy in a way. She protects herself and her students against any “bad guy” who might try to harm them. But her handgun has become more than just a device to use against an attacker. Contributions from Jackie DelPilar, the John and Patty Williams Fellow, Amy Slanchik, an Ethics and Excellence in Journalism Foundation Fellow and Justine McDaniel. 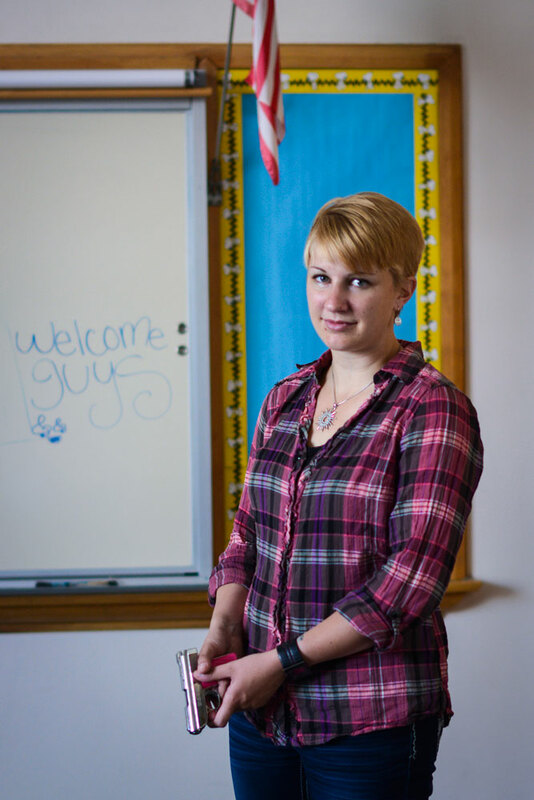 Teacher Kasey Hansen poses with her gun inside one of her classrooms at Valley Junior High School on June 12, 2014. Photo by Jacob Byk/News21. Holladay City Council member Steven Gunn is a member of the Gun Violence Protection Center of Utah’s board of directors. 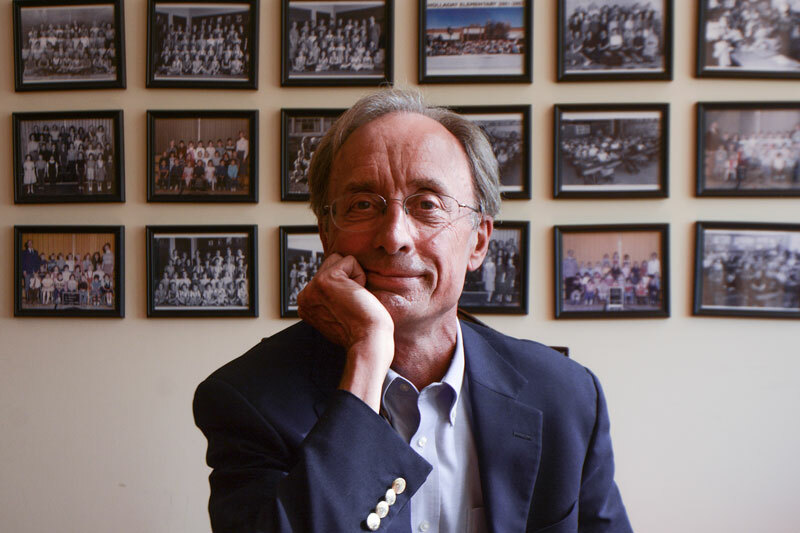 Behind him, class pictures hang in what was once the principal's office of a school that now serves as city hall. Photo byJacob Byk/News21. Children’s health advocate Ted Hallisey said he opposes guns in schools. He runs the Cowboy Ted's Foundation for Kids, a health organization in Bountiful, Utah. Photo by Jacob Byk/News21.